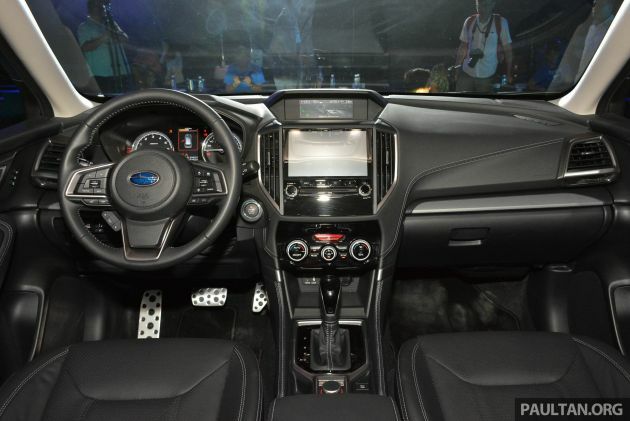 The 2019 Subaru Forester first made its global debut at this year’s New York International Auto Show (NYIAS), and now, Motor Image has launched the all-new SUV in Taiwan. Visually, the fifth-generation (SK) Forester retains the familiar shape of its predecessor (SJ) but with bolder styling. The front end now features a more upright, hexagonal grille that is accompanied by sharper detailing on the headlamps with daytime running lights within them. The bumper has also been made to appear more rugged, most noticeable by the skid plate piece. Depending on the trim level, there are either halogen or LED fog lamps, which are located within more prominent frames. Along the sides, more elements of the “go anywhere look” can be seen with the side skirting, while a more fluid character line flows from the front wheel arches leading towards the D-pillars. Changes at the rear are even more dramatic, with larger taillights that mimic the C-shaped theme of the lighting units at the front. The tailgate also sports a more apparent crease towards the bottom, while the lower apron continues the concludes the rugged look – this, along with the sides and front are either painted black or according to the car’s body depending on variant. Break out the measuring tape and you’ll find the new Forester now measures 4,625 mm long (+30 mm), 1,815 mm wide (+20 mm) and 1,730 mm tall (-5 mm) – the ground clearance is marked at 220 mm. Beneath the evolved appearance, the new Forester rides on the Subaru Global Platform (SGP), which the brand claims offers a more responsive steering, improved crash absorption by 40%, less roll by 50%, along with a quieter a more stable ride as the benefits of switching to this architecture. The SGP is also employed on the latest XV and Impreza, and as a consequence, the Forester adopts a dashboard layout that is similar to those models. A large, 8-inch touchscreen for the infotainment system occupies the centre stack, with a smaller, secondary display nestled just above it to display vehicle information. Moving downwards, you’ll arrive at the controls for the dual-zone climate control followed by the centre console. The latter holds the gear lever plus switchgear for the car’s four-wheel drive modes and other functions – Auto Vehicle Hold, Side View Monitor and electronic handbrake. Along with the familiar, the SGP also brings about a 30 mm increase in wheelbase to 2,670 mm. This makes for a roomier cabin, with rear legroom up by 35 mm to 1,000 mm, while head-, hip- and shoulder room are also increased. Practicality gains include a boot that can swallow 2,155 litres of cargo with the 60:40 split-folding rear seats adjusted – and the maximum width of the tailgate opening is now 135 mm wider at 1,300 mm. For the Taiwanese market, the Forester will be offered in four trim levels – 2.0i-L, 2.0i-L EyeSight, 2.0i-S and 2.0i-S EyeSight. Under the hood, all four options are powered by the Impreza’s updated FB20 2.0 litre direct-injected four-cylinder that makes 156 PS at 6,000 rpm and 196 Nm at 4,000 rpm. The mill is paired with the brand’s Lineartronic CVT and Symmetrical All-Wheel Drive system, along with an idling stop function to lower fuel consumption. Supporting systems include Active Torque Vectoring, SI-Drive, X-Mode and Special X-Mode (2.0i-S and above only). In terms of equipment (keep in mind these are for the Taiwanese market), all both 2.0i-L variants comes with 17-inch wheels (with 225/60 profile tyres), projector LED headlamps, halogen DRLs, active grille shutter, keyless entry and start, paddle shifters, PIN code access and seven airbags (front, side, curtain and driver’s knee). The 2.0i-L EyeSight has the advantage of heated side mirrors, steering responsive headlamps and power adjustable front seats with memory function for the driver. Moving up to the 2.0i-S variants, the kit list is expanded with the addition of aluminum pedals, powered tailgate with memory function and lane change assist. Variants with the EyeSight suite of driver assist systems gain functions such as Pre-Collision Braking and Throttle Management, Lane Sway and Departure Warning as well as Adaptive Cruise Control and Lead Vehicle Start Alert. These are joined by high beam assist, rear cross-traffic alert and the aforementioned Side View Monitor. 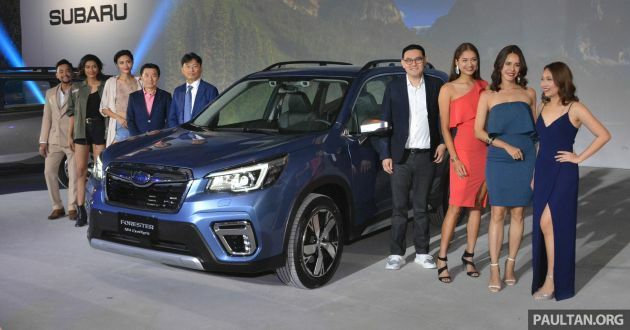 “The all-new Forester is now bigger and better with an all-round enhancement to its technology, interior and exterior to create an SUV that boasts performance, comfort and maximum safety,” said Glenn Tan, managing director of Tan Chong International. “We are thrilled to launch the new, fifth-generation Forester and are confident that the model will excite drivers and create amazing experiences with their loved ones,” he added. For now, there’s no confirmation on when the new Forester will arrive on Malaysian shores and whether it will be a locally-assembled model – the fourth-gen model is currently assembled locally. We’ll keep you posted as more information trickles in, so stay tuned. Proton Boyue seemed more high-end & better equipped with AEB, voice command, adaptive cruise control and 360-degree 3D view. In fact the Boyue has got some of the best features in the market. However, I doubt the refinement of the car will be anywhere near the Forester. I don’t know about U guys but I personally prefer the Girls MORE. Hehehe. Cheers… What say U john?! Don’t even hope TC will include eyesight for the ckd car as they’re profit driven, will cut corners in lowering down the build quality while maintaining profit margin. Don’t believe me? Try to drive the exact same model that TC markets here against the Jdm.. You’ll notice the difference. Not the same infotainment unit again. The screen is useless in Malaysian daylight. And should have the 2.5 for better power with bigger size car. TC will bring in eye see. Cheap indoor plastic with lot of squeaking and cracking noise. This car looks like it was designed 15 years ago. Next Post: MEGA GALLERY: F90 BMW M5 Competition in detail!